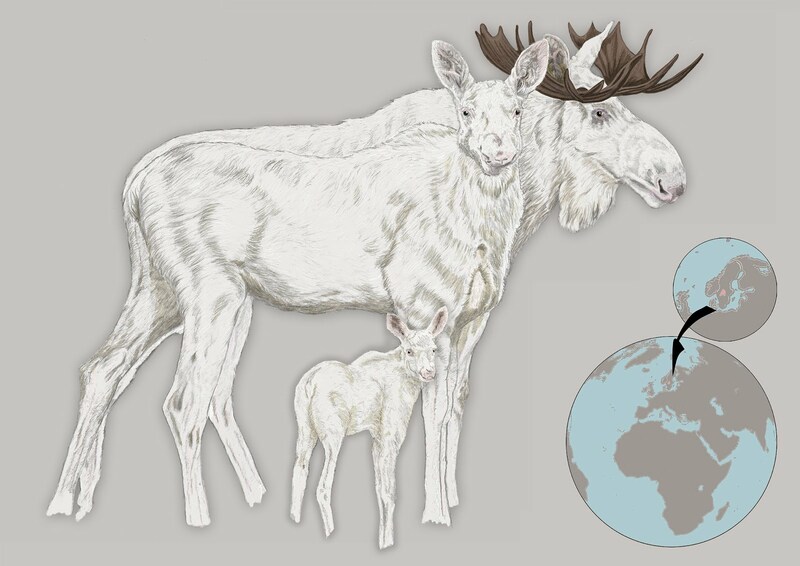 In some parts of Sweden, white elks have been observed since the early 1900s. Today, there is a small population in the counties of Värmland, Bohuslän and Dalsland, estimated to be about 70 individuals. The elks are born with the hereditary gene of leucism, which reduces the pigment in skin, fur or feathers. Animals with leucism are lighter, partly white or pure white. Compared with the similar condition of albinism, the eyes are not often red or blue, which would make them sensitive to light. Also characteristic of leucism is the normal skin colour and coloured lips.It needs both parents to be carriers of the gene, to produce a white calf. That means that a white cow can produce brown calves and a brown cow can produce white calves.